Check the differences between VUDU and WinX DVD Ripper Platinum, and figure out which disc to digital service is more suitable for you. Both new and old DVDs are supported. A year ago, VUDU launched a new feature - Mobile Disc to Digital - enabling users to convert Blu-ray and DVD discs to digital right from iOS or Android smartphones or tablets. It seems to be more convenient than In-Home Disc to Digital - a service established in 2013 requiring users to insert disc into DVD drive of computer for verifying and later conversion. Quite a lot of DVD owners have tried this new service and expressed their opinions online some of which are singled out and attached below. I went to Walmart and they said they don't do the Disc-to-digital conversion anymore, and I have to use the Vudu app to do it. However, some of my blurays could not be identified by the app. I'm also not seeing this option on the iOS Vudu app ....??? Does this work with Disney titles? If you have a hard copy, why not just rip and convert it. It's completely legal with fair use laws. There are apps that do it turn key. From the foregoing comments, we can see that there're many doubts about its eligible titles, GPS, prices, compatibility, capability, and so on. Additionally, we also notice that someone point out why not just rip and convert the discs. Yes, making use of a ripper is another popular way to digitize new or old discs, apart from VUDU. Well, VUDU and disc ripping software like WinX DVD Ripper Platinum - a highly-accepted DVD to digital converter with over 12 years' development, which is more suitable for you? In the following part we will present a comprehensive comparison between VUDU and WinX DVD Ripper Platinum, such as prices, supporting discs, and compatible OS. Thus, you will be clear about VUDU's advantages and disadvantages. Please be noted that what we'll compare to WinX DVD Ripper Platinum here is VUDU's Mobile Disc to Digital service. Also watch disc to digital video tutorial. Check the comparison chart or click on the following links to jump to certain section. 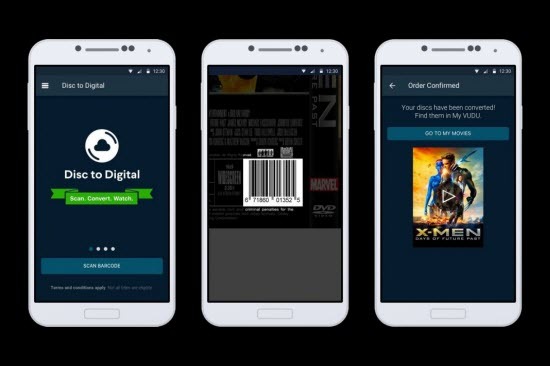 VUDU's Mobile Disc to Digital is a feature that allows users to convert Blu-ray and DVD discs to digitals by using Android or iPhone to scan barcodes on the disc cases. It makes disc to digital conversion much easier. WinX DVD Ripper Platinum is specially designed to convert any DVD discs (incl. new and old discs) to any popular formats or devices on computer. It is well known for superfast digitizing speed and solid support for a wide range of discs. 1. It is not supported within the iOS app. Visit vudu.com/disc on your iPhone browser for details. Note: VUDU charges you $2 or $5 per title. Note: It is one-time fee. Nearly all DVDs you own, no matter which studio produces. It will keep the original quality by default. Certainly, you can adjust it based on your own needs. 1. Compatible platform: Where can I install VUDU and WinX DVD Ripper Platinum for disc to digital? VUDU App is currently available to use on Android and iOS. However, VUDU's Mobile Disc to Digital is not supported within the iOS app. To perform d2d on iPhone, you should visit vudu.com from your iPhone browser. WinX DVD Ripper Platinum is a desktop-based program compatible with Windows (10 and lower) and Mac (10.14 Mojave and lower). Therefore, try VUDU if you prefer to working on mobiles. If you'd like to do this on a computer, WinX DVD Ripper Platinum will do you a favor. 2. Price: How much will we cost for disc to digital on VUDU and WinX DVD Ripper Platinum respectively? Which is more affordable? At first glance, VUDU's disc to digital feature seems much cheaper than WinX DVD Ripper Platinum. Don't hurry to a conclusion. Let's inspect the pricing rules carefully. VUDU charges users based on the quantity of discs and quality they choose, which is quite different from WinX DVD Ripper Platinum and the like. Purchasing a lifetime license code of DVD ripper and you are allowed to convert as many discs as you like and choose favorite output quality without extra fees. Additionally, you will get complimentary upgrade service and tech support. From this aspect, if you only have a few discs to digitize, try VUDU. If you have dozens or hundreds of discs, WinX DVD Ripper Platinum is a better choice because $47.95 only allows you to convert up to 24 discs on VUDU. 3. Limit: How many discs can I convert to digitals with VUDU and WinX DVD Ripper Platinum respectively? Each VUDU account is restricted to convert up to 100 discs, which there's no such limitation on WinX DVD Ripper Platinum. Although the average movie collector possesses nearly 100 DVDs and Blu-rays, there're a fair number of people holding hundreds of discs for digitizing. So this limit possibly brings inconvenience to those guys. 4. Supported discs: Which disc can be converted to digital with VUDU and WinX DVD Ripper Platinum respectively? Others: Workout, old/damaged, home-made DVDs, ISO file, VIDEO_TS folder, etc. Disney discs are currently not in the approved list of VUDU's Mobile Disc to Digital. It only contains about 8,000 movies from Lionsgate, Paramount, Sony Pictures, 20th Century Fox, Universal Pictures and Warner Bros. So, don't be surprised if you fail to digitize some discs, even if they are pretty mainstream titles. WinX DVD Ripper Platinum, specially designed for DVD conversion, supports DVD discs from all film studios including Disney. This DVD converter is one of the few similar programs that support digitizing Disney DVDs, such as Frozen, Zootopia, Star Wars: The Force Awakens, Inside Out and Coco. In addition, it is capable of converting workout DVDs and Japan adult DVDs which apply special encryption technologies defeating nearly all DVD rippers in the market, as well as home-made DVDs, old or damaged DVDs, ISO file and VIDEO_TS folder. So, give WinX DVD Ripper Platinum a shot if you have various kinds of DVD discs and DVD files, especially when you want to convert Disney disc to digital. If your source disc is eligible and you want to process Blu-ray, download VUDU. 5. Output format & quality: What's the format and quality of resulting file? After scanning UPC, VUDU gives you two quality options - SD (480p) and HDX (1080p) - for DVD, and HDX for blu-ray. Files downloaded from VUDU are in MP4 format. Different from VUDU, WinX DVD Ripper Platinum offers a wide range of video and audio formats to choose from. That is to say, not only can you convert DVD to MP4, MOV, AVI and other video formats for playback on any devices, but also you are able to extract audios from DVDs and save as MP3, AAC, iPhone ringtone, etc. Different output profiles provide different qualities. You can choose to keep original resolution, aspect ratio and other parameters, or change as required. 1080p resolution is selectable, but it isn't suggested to do upscaling. 6. Conversion/download speed: How long will it take to convert disc? Conversion is fast, but download speed varies with internet connection. It may only take 5 minutes to convert and save digital copies to local drives directly. VUDU will finish conversion quickly if you won't encounter some errors in the process. However, if you want to download converted digitals for offline playback, you may take longer because it mainly relies on your internet connection. Some users online reported that they even takes one or two or even longer to complete a download. 7. How-to guide: How to convert disc to digital with VUDU and WinX DVD Ripper Platinum? VUDU and WinX DVD Ripper Platinum work quite different. Detailed instructions are as follow. How to convert disc to digital on mobile with VUDU? Step 1. For Android users, download VUDU app from your app store; for iPhone users, open vudu.com/disc from the browser of your iPhone. Step 2. Sign in or sign up your VUDU account. Step 3. Turn on GPS on your mobile device, which helps VUDU to verify your location which must match the address on file. Otherwise, you will fail to convert disc to digital. What's more, iPhone users may need to allow full-time access instead of "while using the app" to make sure that it properly registers your location. Step 4. Choose Disc to Digital option, and then tap Scan Barcode to scan the UPC on your physical disc. Step 5. Select output quality, SD or HDX (Blu-ray is HDX), and then tap Submit List. Before check out and conversion, you may need to wait for a confirmation email. Step 6. Once your discs are converted to digital copies, you can find them in your VUDU library and watch on any VUDU-enabled devices, including televisions, Blu-ray disc players, gaming consoles, streaming players, and phones and tablets with the Vudu app. Additionally, if you have your VUDU account synced with Movies Anywhere, you are also able to watch them through iTunes, Amazon Video, and Google Play. As we can see, VUDU's Mobile Disc to Digital is awesome, but there's one more thing you gotta know. The resulting digital copy is an UltraViolet movie which can only play on UltraViolet-compatible services and devices. That is to say, you need an UltraViolet account. How to convert DVD to digital using WinX DVD Ripper Platinum? Step 1. Download and install WinX DVD ripper on your PC or Mac. Activate this program with your licensed email and code. Step 2. Launch it, and insert your DVD into DVD drive. Then, click Disc button at the top left corner to load source DVD disc. Keep DVD Disc File System Type as default and hit OK. Step 3. Choose output profile. WinX DVD ripper offers 350+ output profiles to address various user needs. You can 1:1 convert disc to ISO image or DVD folder, or convert DVD to MP4, MPEG2, MOV, AVI, WMV, FLV, etc. Just choose one depending on your own needs. Step 4. Hit RUN button and it will begin converting DVD disc to digital. Probably within 5 minutes, we can convert a feature-length DVD to high-quality MP4 (H.264) with the help of Intel CPU, Nvidia GPU, Multi-core CPU & Hyper-threading. 8. Pros and cons: What are the strengths and weaknesses of VUDU and WinX DVD Ripper Platinum? 1. It supports both DVD and Blu-ray. 2. It can digitize disc using mobiles. 3. No disc drive required. 4. It cooperates with several major studios. 5. HDX is available to choose. 6. Digitals can be saved to the cloud or downloaded for offline watching. 1. Disney and many movies are not eligible. 2. GPS is required. And, it often causes errors. 3. It works only from home. 4. Price is too steep if you have a mass of discs. 5. It converts a maximum of 100 discs each year. 6. Downloading and streaming are limited by internet connection. 1. It works on any authorized computer, wherever you're. 2. One-time payment offers lifetime unlimited conversions. 3. It can digitize virtually all movie and TV show DVDs from all studios, including Disney titles. 4. Also fit for workout DVDs, Japan DVDs, music DVDs, home-made DVDs, etc. 5. It permits you to convert as many discs as you need. 6. It can also convert ISO and VIDEO_TS folder to popular formats. 1. Not available for Blu-ray. 2. DVD drive, inbuilt or external, is indispensible. So, VUDU or WinX DVD Ripper Platinum? Now it's time for you to make a decision after reading their advantages and disadvantages. If you like the way that VUDU offers, download VUDU from your app store. If you prefer WinX DVD Ripper Platinum, simply click the download buttons below. Trial before purchase is also permitted.